There’s something about my wife being pregnant and her luck drawing hard to get tags. Three years ago, when Sherry was pregnant with our first baby, Tina, I put her in for a moose draw in eastern Idaho. Now we all know guys who throw their name in the hat year after year with no luck, myself included. Well, we laughed pretty hard the day her CONGRATULATIONS letter came in the mail after only one attempt. The cutest thing I have ever seen was my wife, seven and a half months pregnant, strolling up a hill packing her Remington .308 with a big ol smile on her face. Her smile got even bigger when my brother John and I found her a nice 42″ Shiras Moose, which she dropped with one well placed 50 yard shot! We ate well that winter and the memories of that trip will last a lifetime! The following two years brought no babies and no luck drawing tags. Well that’s the way it goes we thought until this year. 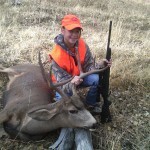 1999 brought our son R. J. as well as the most coveted trophy Mule Deer tag in the state! Approximately 2,000 applicants put in for 50 tags and guess who drew, that’s right, the prego lady! What the heck is going on here? As soon as I got the good news off the internet I called Sherry at home and told her to get her rifle out and start practicing. She had no idea what I was talking about until I explained that she just drew the tag of a lifetime! She was very excited to say the least, but didn’t realize what she had until we attended the Idaho Mule Deer Foundation Banquet. Every body we talked to that evening was amazed that she actually drew a tag. A friend of mine introduced us to Steve Alderman, who grew up in Sherry’s hunt area and volunteered to take us into one of his areas and show us around. Living in Melba farm country allows me to put a rifle range in the back yard and we practiced marksmanship every chance we got. We even paid the neighbor kids to come over and baby sit while we shot. Sherry practiced on 18″ steel plates from the standing, sitting and prone supported positions. We even shot a few times over the four wheeler just in case that kind of shot was presented. By October Sherry was ringing the 400 meter target regularly. Opening morning was warm for November. We unloaded the four wheelers drove into the hunt area. By daylight we were in the middle of 30 deer, five being bucks. We glassed them hard, but none met our expectations. We drove to the end of a two-track road and parked the four wheelers. After glassing numerous bucks, I spotted a possible wall hanger across a canyon about a mile away. Even from that range we could tell he was bigger than most of the deer we’d been seeing. We snuck over to a small depression and peeked over the side. There he stood 200 meters out surrounded by six does. We field judged him a 30″ 4×4 and thought he was a good buck. Not a monster, but a great looking buck for the living room. Sherry and I made the decision to take him. She got into a prone position supported by my day pack. She held right on his shoulder and squeezed the trigger. The buck jumped and Steve and I yelled “you got him” at the same time. Sherry chambered another round and got back on target just like we practiced all summer. The buck started walking away and I told Sherry to shoot him again. As soon as I said that the buck fell down dead. The 150 grain Hornady Light Magnum round did its job. The bullet mushroomed perfectly and came to rest underneath the hide on the opposite side. We waited a few minuets and walked over to Sherry’s deer. She was all smiles when she got close enough to appreciate her trophy. All the planning, scouting, rifle practice, and baby sitting expenses paid off! Sherry accomplished what she set out to do; put a nice mule deer on the living room wall right next to her moose. Thanks to Steve for the patience, his knowledge of mule deer, and the entertainment he provided during the hunt. The video he made of Sherry’s hunt is priceless and just adds to the memories of a great hunt. I hope this pregnancy thing doesn’t get to be a habit, I can’t afford any more kids!